As Sheriff Ozzie Knezovich called on the Spokane County Commission to preserve funding for his department, volunteers from SCOPE – the sheriff’s community-oriented policing effort – turned out in droves to reinforce his message, declaring public safety a top priority at several budget hearings this year. Their efforts seemed to pay off this week, when the commission passed a 2018 budget that not only avoids cuts to law enforcement but gives the Spokane County Sheriff’s Office a modest funding increase. Commissioners did, however, look elsewhere to avert a $9.4 million budget shortfall. The Spokane Regional Health District, for example, saw its share of county funding reduced by 17 percent, to $2 million. County funding for the health district – which is a stand-alone agency and not a county department – has dropped each year since 2015. Since 2009, Smith said, it has fallen nearly $900,000, about 30 percent. That, along with stagnant funding from the state and no contributions from city coffers, has forced the health district to make “significant adjustments” since about 2000, he said. That’s when Initiative 695 and subsequent legislative action changed Washington’s tax structure, leaving counties to pay more for public health agencies, as well as services such as transit. “They are sort of the sole supporters, locally, of public health, but that’s what the law says: It’s a county obligation,” Smith said. On Thursday, the health district’s governing board, which includes all three county commissioners, passed its own budget for 2018 totaling about $30.1 million – significantly larger than this year’s budget of $26.7 million. Smith said the increase is partly because the agency needed to expand its methadone treatment program for opioid addicts. While the county’s contribution is a relatively small piece of the health district’s budget, Smith said it’s one of few “flexible” funding sources that can be used for epidemiology work, such as monitoring the spread of the flu virus and studying the prevalence of diabetes. Most of the agency’s revenue, Smith said, comes in the form of program-specific grants with many strings attached. One special-education grant, for example, passes through the health district and is ultimately spent by contractors such as the Spokane Guild School, he said. Smith said the county funding cut likely wouldn’t result in layoffs next year, but he said the health district would run out of other options if the county’s contributions continue in decline. “This isn’t going to put us under right away, but we’re certainly heading in the wrong direction,” he said. Commissioner Al French said the commissioners needed to prioritize county departments before outside agencies. 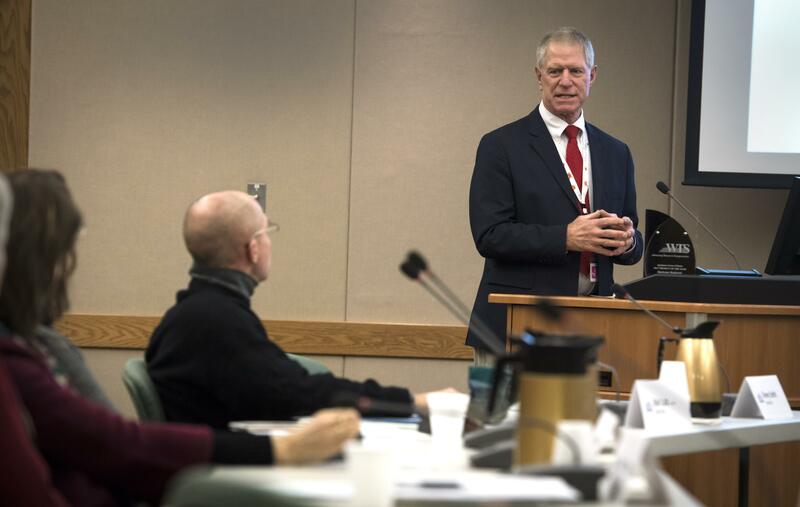 He noted that Greater Spokane Incorporated also took a reduction, while some other outside agencies, including the Washington State University extension in Spokane, received the same amounts as last year. The predicament also raised the question of whether cities should contribute to the health district’s budget. The agency does, after all, have board members representing Spokane, Spokane Valley and the smaller cities in the county. Spokane City Councilwoman Karen Stratton, who sits on the board along with council members Breean Beggs and Lori Kinnear, said it’s a topic worth exploring. Commissioner Josh Kerns, who cast the sole vote against the county’s 2018 budget, said it didn’t go far enough in reducing spending. He said the county could save more money if it outsourced payroll and accounts payable services, among other changes. Commissioner Mary Kuney said that while changes could have been made to the county’s budget up until Monday’s vote, much of it was crafted before she was appointed to the all-Republican commission in late September. Kuney, a certified public accountant, said she’s now pushing her fellow commissioners to start the budgeting process for 2019 as early as next month. Knezovich said he’d be encouraged to see a more thorough and transparent budgeting process. While next year’s budget means he won’t have to lay off deputies, he said it still doesn’t include enough money to replace patrol vehicles that have too many miles on them. Published: Dec. 7, 2017, 7:16 p.m. Updated: Dec. 7, 2017, 9:05 p.m.